How do I download video from YouTube? I have found a small and simple application for my Mac that download and converts YouTube video. 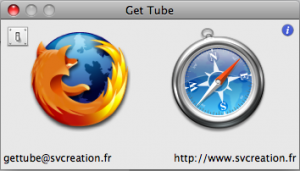 The software is called “GetTube” and you can download it form http://web.mac.com/simonvrel/en/gettube/gettube.html. This app is very basic. You can download any YouTube video as an MP4, AVI, MP3 or FLV. This is perfect for all the video uses I have, weather showing in MediaShout or editing in iMovie. I am sure there are dozens of other apps we could talk about but this should get you started. Start with second set of online apps and see how they work for you. The good thing about those (if they are running) is they will work for you on Mac or a PC. I also use Tooble (http://tooble.tv/) on the mac. Works great. i use TubeSock for mac. Try VideoGet. It downloads from YouTube, GoogleVideo, MetaCafe, MySpase, Photobucket and other 600+ video websites. I was using tubesock 1.0 for my mac 10.3.9 for two months, worked perfectly, it was the $15 version, well worth the price. However, one week ago, suddenly, when trying to download a youtube video, a small window appears saying download failed, file not exist. I have emailed and called stinkbot many times, never an answer. Do you have any idea why this happens? I have even tried to re-download tubesock but the same problem exists. Please let me know if you have any ideas about this as I would deeply appreciate it! No idea…try gettube, it is free.